Do people say you’re a know-it-all? Prove them right at SEASPAR’s 7th annual Trivia Challenge fundraiser! This year’s event returns to the American Legion Post 80 in Downers Grove on Friday, October 19. Doors open at 6 p.m. and the games begin at 7 p.m. The Trivia Challenge is a fun, informal competition. Teams answer general knowledge and trivia questions, and the team that has correctly answered the most questions at the end of the competition receives a $500 cash prize! New this year – Since the event is just before Halloween, add to the fun by wearing your favorite costume! Will your team be the best dressed? Tickets for the Trivia Challenge are $25 per person. Tables of ten may also be purchased for $225. A cash bar is available and food is provided, or you are welcome to bring your own snacks. Online ticket sales have ended. Please call the SEASPAR office at 630.960.7600 to inquire about ticket availability. Organizations and individuals are also invited to sponsor the event. Learn about sponsorship opportunities by contacting Lisa Rasin at 630.968.7857. 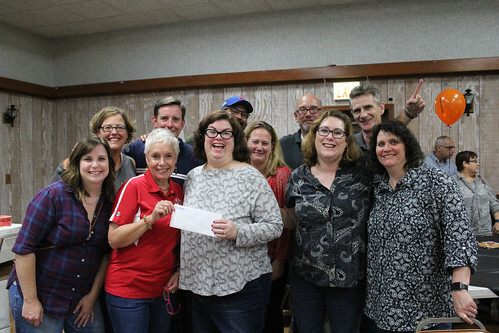 Proceeds from the Trivia Challenge will be used to support our recreational programs and services for individuals with disabilities served by our member districts. Come boast your brainpower while benefiting SEASPAR! For more information, call Lisa at 630.968.7857. Please note: SEASPAR’s email delivery may be impacted by system upgrades on Thursday and Friday, October 18 and 19. If you would like to inquire about ticket availability or otherwise communicate about the event during this time, please call the SEASPAR office at 630.960.7600 between 8:30 a.m.-4:30 p.m., or call Lisa at 630.479.1392 on the night of the event. View photos from last year’s event on Flickr or browse the gallery below!